UNIVERSITY HEIGHTS -- SAN DIEGO, CALIF.
University Heights is one of San Diego's oldest communities. Its heart is near the intersection of Adams Avenue and Park Boulevard. Search the online University Heights Community Directory for a complete listing of local merchants and organizations. 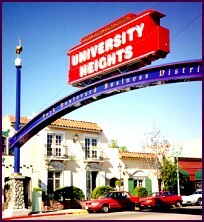 University Heights is showing leadership in San Diego community redevelopment. Many building fronts and interiors have been brought back to original condition. Many new buildings have come into the community and added their special character.